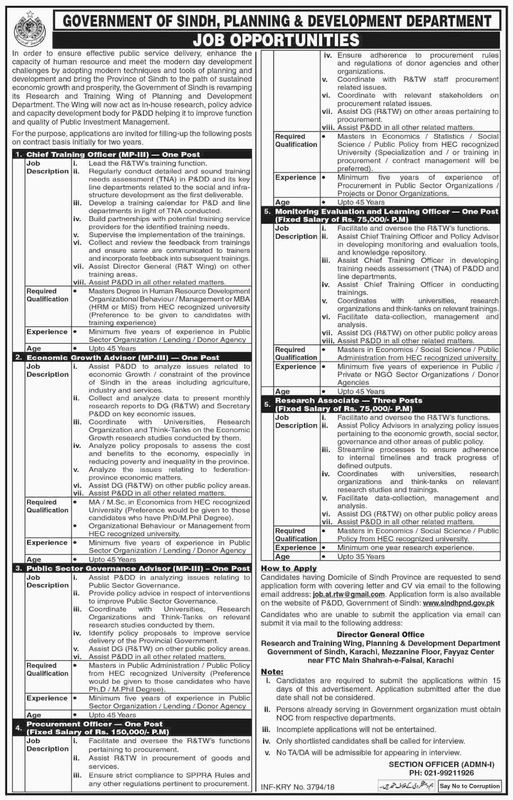 Government Of Sindh Planning & Development Department Karachi Sindh. In order to ensure effective public service delivery, enhance the capacity of human resource and meet the modern day development challenges by adopting modern techniques and tools of planning and development and bring the Province of Sindh to the path of sustained economic growth and prosperity, the Government of Sindh is revamping its Research and Training Wing of Planning and Development Department. The Wing will now act as in-house research, policy advice and capacity development body for P&DD helping it to improve function and quality of Public Investment Management. For the purpose, applications are invited for filling up the following posts on contract basis initially for two years. i. Lead the R&TW's training function. ii. Regularly conduct detailed and sound training needs assessment (TNA) in P&DD and its key line departments related to the social and infrastructure development as the first deliverable. iii. Develop a training calendar for P&D and line departments in light of TNA conducted. iv. Build partnerships with potential training service providers for the identified training needs. v. Supervise the implementation of the training. vi. Collect and review the feedback from training and ensure the same is communicated to trainers and incorporate feedback into subsequent training. vii. Assist Director General (R&T Wing) on other training areas. viii. Assist P&DD in all other related matters. i. Assist P&DD to analyze issues related to Economic Growth/constraint of the province of Sindh in the areas including agriculture, industry and services. ii. Collect and analyze data to present monthly research reports to DG (R&TW) and Secretary P&DD on key economic issues. iii. Coordinate with Universities, Research Organization and Think-Tanks on the Economic Growth research studies conducted by them. iv. Analyze policy proposals to assess the cost and benefits to the economy, especially in reducing poverty and inequality in the province. v. Analyze the issues relating to federation-province economic matters. vi. Assist DG (R&TW) on other public policy areas. vii. Assist P&DD in all other related matters. • MA / M.Sc. in Economics from HEC recognized University (Preference would be given to those candidates who have PhD/M.Phil Degree). • Organizational Behaviour or Management from HEC recognized university. i. Assist P&DD in analyzing issues relating to Public Sector Governance. ii. Provide policy advice in respect of interventions to improve Public Sector Governance. iii. Coordinate with Universities, Research Organizations and Think-Tanks on relevant research studies conducted by them. iv. Identify policy proposals to improve service delivery of the Provincial Government. v. Assist DG (R&TW) on other public policy areas. vi. Assist P&DD in all other related matters. • Masters in Public Administration / Public Policy from HEC recognized University (Preference would be given to those candidates who have PhD / M.PhiI Degree). i. Facilitate and oversee the R&TWas functions pertaining to procurement. ii. Assist R&TW in procurement of goods and services. iii. Ensure strict compliance to SPPRA Rules and any other regulations pertinent to procurement. iv. Ensure adherence to procurement rules and regulations of donor agencies and other organizations. v. Coordinate with R&TW staff procurement related issues. vi. Coordinate with relevant stakeholders on procurement related issues. vii. Assist DG (R&TW) on other areas pertaining to procurement. • Masters in Economics / Statistics / Social Science / Public Policy from HEC recognized University (Specialization and / or training in procurement / contract management will be preferred). • Minimum five years of experience of Procurement in Public Sector Organizations / Projects or Donor Organizations. i. Facilitate and oversee the R&TW's functions. ii. Assist Chief Training Officer and Policy Advisor in developing monitoring and evaluation tools, and knowledge repository. iii. Assist Chief Training Officer in developing training needs assessment (TNA) of P&DD and line departments. iv. Assist Chief Training Officer in conducting trainings. v. Coordinates with universities, research organizations and think-tanks on relevant trainings. vi. Facilitate data-collection, management and analysis. vii. Assist DG (R&TW) on other public policy areas. ii. Assist Policy Advisors in analyzing policy issues pertaining to the economic growth, social sector, governance and other areas of public policy. iii. Streamline processes to ensure adherence to internal timelines and track progress of defined outputs. iv. Coordinates with universities. research organizations and think-tanks on relevant research studies and trainings. v. Facilitate data-collection, management and analysis. • Masters in Economics / Social Science / Public Policy from HEC recognized university. • Minimum one-year research experience. Candidates having Domicile of Sindh Province are requested to send the application form with covering letter and CV via email to the following email address: job.at.rtw@gmail.com. The application form is also available on the website of P&DD, Government of Sindh: www.sindhpnd.gov.pk. I. Candidates are required to submit the applications within 15 days of this advertisement. Application submitted after the due date shall not be considered. II. Persons already serving in Government organization must obtain NOC from respective departments. III. Incomplete applications will not be entertained. IV. Only shortlisted candidates shall be called for interview. V. No TA/DA will be admissible for appearing in interview. Government Of Sindh Planning & Development Department.